Yesterday, I published the names of the transmitters that will be carrying the ten new HD channels - Want to know which transmitters will carry extra Freeview HD?. Today, you can now see the estimated coverage areas for these two new multiplexes (by clicking on the labels HD-com7 and HD-com8) on UK Free TV, as per the example. In addition, if there is a radiation pattern for the mast, it is also shown on the relevant transmitter page. when will stv2 be transmitted from knockmore tv transmitter in grampian we get other freeview channels. w miller: Probably never. STV2 is broadcast under local TV licences Glasgow, Edinburgh, Ayr, Dundee and Aberdeen. The only way to watch outside these areas is via Sky (channel 117) or STV's website or smart phone/TV apps. Do you know if the full range of children's tv channels will be broadcast in the Doncaster area or have a page with channel opening timelines or such on? At the moment we only get the bbc/citv ones and pop really would like the new ones but when i checked on free-views website and did the post code checker it stated only ketchup but when scanned in it doesn't appear. So i wondered when i scan next time if i say i am in Lincolnshire when it asks for location would it use belmont tower and not emley moor? and if so would it unlock channels previously unavailable? Brilliant site by the way exactly what is needed keep up the good work. To assist with your query we need you to provide a full post code of your location please? TGhat way we will be able to determine what the reception is like from the different transmitters. As far as is understood at present, there is not expected to be any changes to the services being broadcast currently. Emley Moor and Belmont. both being 'main' transmitters, are likely to carry the same mix of programming with regional differences only. Is there a problem with the transmitter that sends the signal to Radio Bristol, for our dab radios, other stations seem to be fine. Our postcode is BS354pu?. To answer your query you need to provide a full post code, just saying 'Teignmouth' is not sufficiently accurate to determine which of the possible transmitters you should be using. 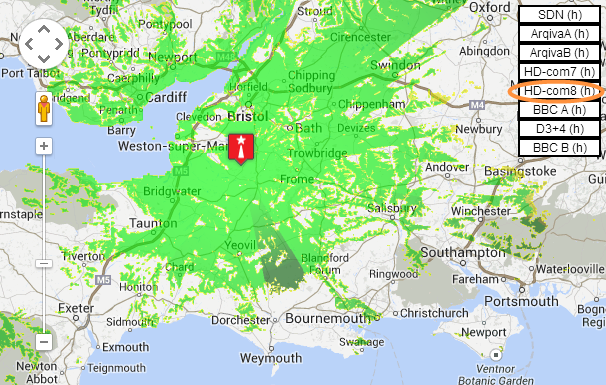 There are no reported problems at the Teignmouth Freeview Light transmitter. Your question would have been better posted on the page for that transmitter, at https://ukfree.tv/transmi…UTH. g webber: There are no faults showing for the Teignmouth transmitter. Have you checked for any loose or damaged cables or connections behind your TV? My Postcode is BA21 3PS. until about two weeks ago we could receive channel 81 (Talking Pictures) on two on two tv's with HD boxes and two smart tv's. Now only one smart set will receive this channel and then we have to occasionally retune it. We have tried numerous time to retune each set but to no avail. when checking the HD boxes 81 is not even listed so we can't tune in manually either. Mendip transmitter is line of sight about twenty miles distance. We have received from this transmitter since it was erected. Clive: Your pretty close to two transmitters and you should get an excellent signal from either. Check the mux that channel is on, and then look at the signal strength. I'm guessing it very very low. Best bet, since almost all your TV's are being hit, that its your system, and something probably common to all - perhaps a splitter, etc. Check the connects generally.